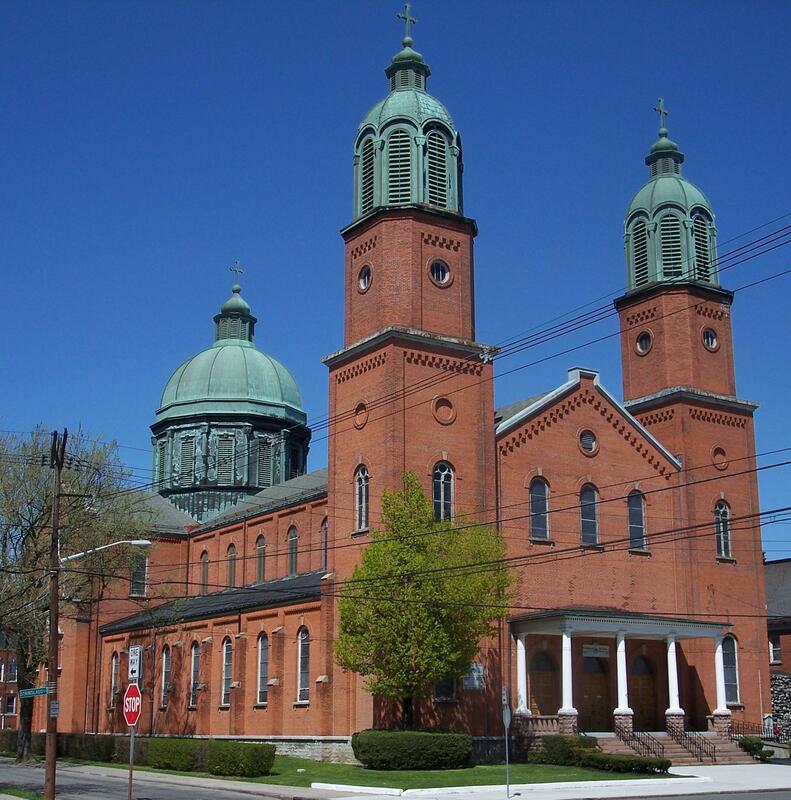 St. Adalbert’s – Is It A Basilica? I clearly had no idea what I was getting into when I started digging into St. Adalbert’s history recently. It started innocently enough. I was intrigued as to why anyone would hold a Polka Mass (Mass celebrated with polka music) at St. Adalbert’s in Buffalo, New York. The gist of the story is that St. Adalbert’s has been caught up in the closure of parishes in the Diocese of Buffalo, and they’ll be merged with another parish. St. Adalbert’s will only be available for special occasions (like weddings, baptisms, etc). The parishioners were holding the Polka Mass to raise money. As you may recall from The List, St. Adalbert’s was listed as the first basilica in the US. I was confused as to why anyone would want to shut down a basilica, which should be a pilgrimage for the faithful. To clear up my questions, I was going to call St. Adalbert’s, but then decided I should probably get an unbiased opinion (news reports make it sound like the closing is a pretty bitter fight), and decided to check with the Diocese of Buffalo instead. According to the email I got back, St. Adalbert’s is not a basilica – they had gone so far as to check with the Vatican. Instead, it is affiliated with a major basilica; in this case, St. Peter’s. It was suggested in the email that the parishioners of St. Adalbert’s lost sight of this distinction over the years since the proclamation in 1907. Although I trusted the Diocese of Buffalo, that seemed like a huge oversight, so I checked some other sources and studied up on affiliated basilicas (spawning yesterday’s post). Wikipedia had a lively-but-dated conversation from 2008 with no real conclusions, noting that the Basilica of St. Mary in Minneapolis, MN also claims to be the first basilica, as St. Adalbert’s traces its proclamation to 1907, while St. Mary’s traces its to 1926. Also, there seems to be a suspicious lack of a tintinnabulum and umbraculum at St. Adalbert’s. Finally, I found the primer on minor basilicas from 1959. It notes in there that St. Adalbert’s is affiliated with St. Peter’s, although this doesn’t mean it can’t also be a minor basilica. But it also lists the 12 minor basilicas as of 1959 – St. Adalbert’s isn’t listed. The author notes that there’s a chance for minor basilicas that the proclamation wasn’t published in the A.S.S. or A.A.S (essentially a gazette of proclamations from the Vatican). However, he goes on to say that the more likely case is that the church in question is affiliated with a major basilica. I spent a little time looking around for some primary source of information regarding all this. The Vatican doesn’t seem to have posted a comprehensive list of basilicas, which means relying on the A.S.S. and A.A.S., both of which are published in Latin. I couldn’t find “Adalbert” or “Adalbertus” (the Latin version) in the publications from 1906-1908, but my Latin doesn’t extend much past the Pater Noster and a handful of phrases, so I could have missed it. But, I trust that the priest who wrote the 1959 primer could read Latin, since he references the A.S.S. and A.A.S. when discussing minor basilicas and affiliated basilicas in the US. He likely has his list of minor basilicas up to 1959 correct. Please know that I don’t post this with the intent of pointing fingers or being nit-picky. Churches are churches and all worthy of respect. St. Adalbert’s looks gorgeous from the pictures I’ve seen online, and her parishioners certainly seem to love their church. I would still love to visit the church if I can find a time when it’s open. There’s a chance I have made some oversight in my investigation of this matter, but in regards to my personal quest to visit all the US basilicas, I don’t think there is enough evidence for St. Adalbert’s to keep it on the list. Back down to 68 basilicas in 64 cities. I’d like to give a special thank you to my boyfriend, who has endured countless emails and conversations with me over the past two weeks hashing out what an affiliation with a major basilica entails, where it shows up in the US, lamentations on why I can’t find anything about it, joy over the affiliation at the Shrine of Our Lady of Guadalupe, excitement over finding the A.A.S., despair on how I can’t read Latin to do any real fact checking, frustration at trying to correct Wikipedia, and my general confusion over St. Adalbert’s in general. I suspect he may never want to hear about affiliated basilicas again. We have in this Congregation received letters from some people in the pastoral area of St. Adalbert in Buffalo in which we are asked if we can trace in our office some documentation on this church being a Basilica. I think it best to write to Your Excellency and copy to the people of St. Adalbert’s to say what information we have. We have indeed a record in our Congregation that St. Adalbert’s church, Buffalo, N.J. [sic], was given Brief as Basilica by Pope St. Pius X on 11th August 1907.